The job search is perhaps the most difficult job that has been done in ones life. Although there are thousands of ways and tools to search the desired job, most candidates often have some misconceptions about the right way they should search. We analyze the following job search myths and truths about finding a job and provide solutions for what we need to do to find the dream job you are looking for. Myth #. 1: Your CV should have a certain length depending on your years of experience. Truth: it is a matter of quality, not quantity! Tip: Include information that relate directly to your role and duties in the past, and with the duties of the position to which you’re applying. There is no absolute rule that defines the size of a CV – but there are some general rules you should pay attention. If your CV is long, with multiple pages, it is very difficult for the employer to see your achievements with a quick scan. For those who have significant work experience, this means that you should omit or limit non-related work experience. If your CV is very small, the employer may not understand what you have to offer and they’re will not look further to find out further information. Myth #. 2: your application will be read very carefully. Truth: You have just six seconds to impress your employer before passing to the next candidate. Tip: Most employers will take a quick look at your resume before taking their decision. If interested, they will read below. To immediately turn heads, make sure that all the important elements of your CV is visible on the first page and is configured so that it is easy to read. Split into sections in your resume, make sure your titles are correct and read the advert properly to see if you have included all the required information. Also, make sure there are no typos, syntax or spelling errors, as such errors can directly get you out of the game. Myth #. 3: The cover letter is not required unless requested. Truth: The cover letter is one of the most important tools in the job search process and should always be send along with your application. Tip: While it is true that employers often do not read cover letters, a targeted cover letter should boost your application. The cover letter is usually read after the employer decides that you are capable for the job or seen something interesting in your CV, but has not yet decided with the job offer. As it stands, the cover letter is an essential element of your application and helps the employer to decide whether to hire you or not. Without the cover letter, the employer has questions about your CV that go unanswered (This is why you should always send a cover letter that is targeted to the position you’re applying). Myth #. 4: A CV can be used for all jobs. Truth: Your résumé should be targeted based on the position in which you’re applying. Tip: Most candidates make the mistake and use the same CV for all positions in which they apply. If you want to distinguish your CV, do the necessary research and target your CV depending on the position and the company to which you’re applying. The majority of large multinational companies use an automatic control system which filters the candidates CVs before its seen by the employer. Target your CV using the same keywords that appear in the advert, focusing on concrete achievements and skills relevant to the position, and make sure they meet all criteria written in the job ad. This way, you are more likely to pass to the next stage and to have the opportunity to prove yourself in the interview. Myth #. 5: If you follow up on your application, this means that you are interested in the position in the eyes of the employer. Truth: If you’re a good candidate, the employer will call you. Tip: The information in your application (CV + cover letter) should speak for you and to exemplify as a possible candidate. To contact the employer to “show your interest” in the position, is not going to change his opinion as to whether you are fit for this position. Instead of doing a follow up via Tel. or email, start following the employer/company on Twitter, LinkedIn – not to compel the employer to get an instant decision at that time. Although some employers will respond right away, others may take even weeks to reply, in accordance with the recruitment procedures that follow – so if you have news, this is bad news! Be patient, and if you are the right candidate, the employer will call you. Myth #. 6: There are certain questions that you need to ask in an interview. Truth: Ask anything in concern. Tip: You get 1–2 hours from your employer for the interview in order to decide whether you’ll be hired – make the time to count on your side! Make questions relevant to the position to which you’re applying, and which will make you understand what role / duties you’ll take in the company. To start asking mundane questions just to pass the time does not serves anyone and is a waste of time for you and for your employer. Myth #. 7: all questions must be kept for the end of the interview. Truth: The interviews should be interactive and you should ask questions when necessary. Tip: Many employers will tell you politely that they’ll answer all your questions at the end of the interview, but generally an interview should flow like a normal conversation. If the employer asks a question, answer is needed. Reciprocating frequent asked questions–answers you will be able to get answers on specific issues to employ and to deepen the topics in concern – otherwise you will wait until the end of the interview and you’re most likely to have forgotten what you wanted to ask. Myth #. 8: The best way to get a job is to apply through job websites (job boards). Truth: Networking and social media is the best means to get a job. Tip: most companies pay handsomely, thousands of dollars every year, to put their ads in large job boards, until recently. Today, the situation has changed. Although many employers are putting even job ads in major job boards in Nigeria and abroad, others have gone to active research candidates via social media. See relevant pages and groups in social media – especially Twitter and LinkedIn groups – in order to find the right candidate. And also effectively exploit their network of contacts. If there is a particular company that you are interested in, don’t wait till when they open the position that you are seeking – there may be a hidden positions in the company that is perfect for you! Connect with HR Managers and decision makers of your dream company, talk to them, ask for the position you are interested in. connect with people and build a professional relationship with them. Also, you can enter into various groups on LinkedIn, where various professionals are focused and to follow up on discussions, make comments or questions that you probably have. Whatever you do, it is important to know that your network of contacts can help you find your next job. See: How To Use LinkedIn To Get Your Dream Job: The Best Tips! Myth #. 9: Do not discuss anything related to your salary before the proposal for the job. Truth: Do your research! That is why there is Glassdoor. Tip: The discussion of salary is always a difficult situation. Most advice suggests that it is better to leave this piece till the end of the interview. It is a difficult decision, if you ask for more money than they can give you, you can automatically get Unlisted, if you ask very little money, it is very difficult then to get a pay rise within a reasonable time. Most candidates want to hear a certain amount in order to accept the job – if you arrive at the third interview and hear something less, you’ve wasted your time and the company. If you are in this situation, it is good to research your position early enough, giving a range of values for the desired salary you would like to receive. Otherwise, do a market survey and Keep in mind the monthly wage received by workers in the same position in other companies, as well as for the company. So, if you need to answer to a press question, “What salary would you like to receive” – your response will be within the payroll of the company to be able from there to negotiate your final salary. Myth #. 10: Promote yourself in every way to win the attention of the employer. Truth: The skills will ensure your job – not the tricks. Myth no. 11: If you follow the rules, you will immediately get a job. Truth: There is no “secret recipe” to get a job. Tip: Every job is different, every company is different, and each employer is different. There are some rules used by employers in their search, but in fact, every employer is looking for something specific that they either have or not. If you do not receive replies to job applications, find out what went wrong, change your job search strategies and continue until you find your desired job. As we said earlier, the days we made applications blindly and get jobs are over – so used all the tools you have in your hands in order to build a professional CV and submit it to the right companies. What are some of the job search myths you have heard? 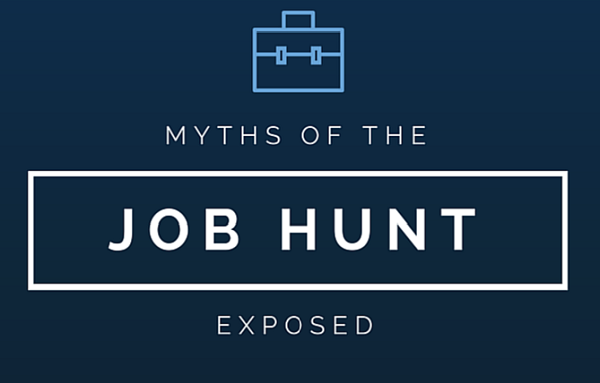 If you know of any other job search myths, let me know via the comments section below. ← Total International Programme For Juniors (VIE) – Apply Here! Pingback:Do You Really Need A Degree When Looking For A Great Job?